How important is Metta World Peace to the Los Angeles Lakers? Well, NBA 2K12 says the team would win the Western Conference with him in the lineup. As it is, he's suspended for the next six games, and that's exactly as long as Denver will need to dispatch the Lakers, according to the game. In an all-background sim of NBA 2K12 with the most current roster, released yesterday—and its depth chart is adjusted to reflect the absence of World Peace—Los Angeles won the first two games at home, then lost four straight to the Nuggets. 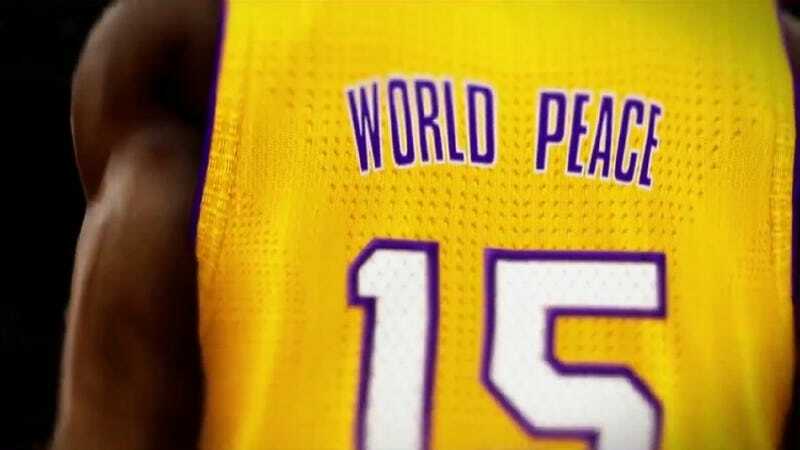 On the bright side, L.A., this concludes all of Artest World Peace's suspension, so you'll get him back in time for your next game, which will be around Oct. 30. He got the timeout when he went all Thunder-Punch He-Man on James Harden of the Oklahoma City Thunder last Sunday. After getting 32 and 41 points from Kobe Bryant in games one and two, the Lakers gagged away a 10-point lead in the fourth quarter of game four to knot the series, and utterly disintegrated in the thin Rocky Mountain air, losing 108-80 in game six. Elsewhere in the first round of the simulation, the eighth-seeded Philadelphia 76ers tip off at this moment against the top-seeded Chicago Bulls, on TNT. NBA 2K12 says the Sixers will go seven games before losing 107-97 in the finale; Orlando dispatches Indiana in six to set up an all-Sunshine State second round versus the Miami Heat, winning in six against New York. Boston eases past Atlanta in five. In the Western Conference, San Antonio cruises by Utah in five; Memphis likewise defeats the L.A. Clippers 4-1. The big stunner, in addition to Denver ending the Lakers' season, is the Dallas Mavericks taking out second-seed Oklahoma City in 6 games. The Thunder suffer an eight-point third quarter and get walloped 120-78 in the clincher. In the second round, NBA 2K12 calls for a four-game sweep of Memphis by the Spurs, to face Denver, which prevails in six over Dallas. In the Eastern Conference, Boston stuns the Bulls in seven to meet the Heat, six-game winners over Orlando, reprising their second-round matchup from last year. Conference winners, according to the game, will be the Spurs in five and the Heat in five, an eminently safe call. Incidentally, the simulation with Artest in the lineup had the Lakers facing Miami in the finals. I only simulated through the conference championships. I'll revisit this when the actual Finals pairings are set. Finally, you may be wondering what happened to Biff Tannen's Sports Almanac. I got an email from the future, with a picture showing Biff's apartment totally trashed, pages from Gray's Sports Almanac shredded and littering the living room, a shattered Mr. Fusion hurled into the fireplace. Biff was 20 games underwater and it seems his bookmaker sent some old-school thumb breakers from 1976 to collect. "o xant gelief theyd do tfis," Biff writes. "i swar i was gona hut it big w/nhl plaoofs." Sorry Biff.